I have really been trying to make dinner a delicious yet healthy time in our home. Every weekend I research recipes online and make a menu for the following week. It has really helped keep me on track and it takes some pressure off the dreaded "honey, what's for dinner?" conversation that scares me. 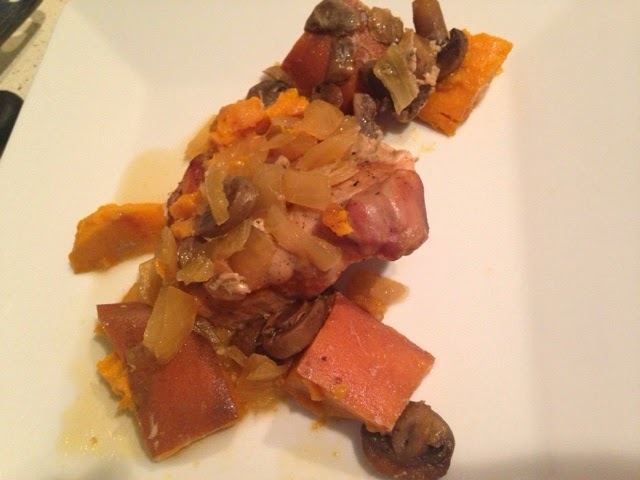 This recipe comes from Pinterest and involved using my crock pot which means it was easy. 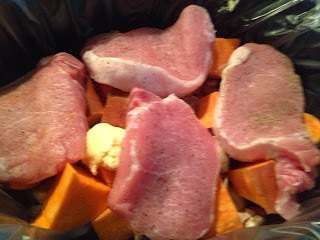 I had never had sweet potatoes before but I was very impressed and loved the sweet taste with the pork chops. 2. Put onions, potatoes, and mushrooms into crock pot. Put the pork chops on top of the ingredients. Pour in chicken broth. Yesterday all hell broke loose. I feel that Target should have known that nothing was going to stop preppy princesses and sorority girls from getting our Lilly. The fact that I live in Utah was something I was counting on as an advantage, especially since I'm not in Salt Lake City. 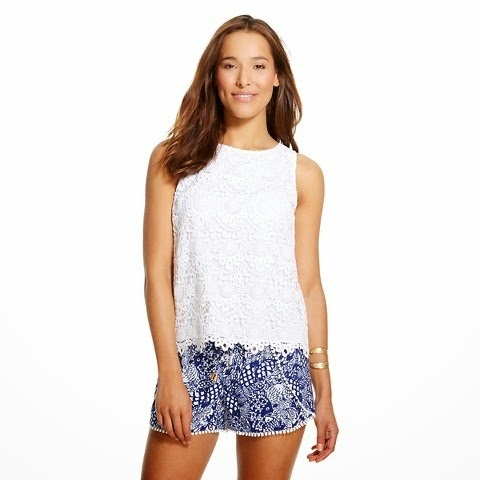 I had never been excited or shopped from any of the previous Target collaborations so I feel I was poorly prepared. Sunday morning I rolled up to my local Target at seven thirty and was ecstatic to see I was the first person there. As opening time got closer, a group of about ten of us were chatting about what we wanted and how excited we were. They opened the doors, let us in before the lights were on, and we grabbed our shopping carts. Once we got to the Lilly section, we all kind of let out a disappointing sigh. The area was two racks and only had about ten of the clothing items on it. The wedge sandals I desperately wanted were an online only item and so were some of the other items the other women were looking for. They only had one of the dresses I wanted. I did walk out with two dresses and a top but it will still not as much fun as I thought it was going to be. By the time I got home everything online was gone and my shoes were a trillion dollars on eBay. I am super excited about my three items but bummed I couldn't get my number one wish list item. After seeing the craziness some people had to deal with, I'm glad my area was nice and calm even though that's probably why we didn't get much stuff. Next time, I will just go online from the beginning. I should go on record and say that my absolute favorite pasta sauce is alfredo. The only time I eat "red" sauce is with spaghetti. However, I had always wanted to try and make my own spaghetti sauce because I feel it's one of those recipes that all good cooks have. Pinterest led me to a recipe from Table for Two that seemed easy enough. Their process of making it was simple and it made the apartment smell delicious. You have to let it simmer for at least two hours which is a real testament to willpower because it smells so freakin' good! After the two hours I put it over some spaghetti noodles and a legendary dinner was born. Well... maybe not legendary but The Husband couldn't stop raving about the sauce. He ended up toasting some garlic bread and eating it with the sauce as a snack for two days after. 2. Season your meat and cook it over garlic until cooked all the way through. 3. Pour in tomato paste, tomato puree, and all seasonings and sugar. Mix well. Add 6 oz of water and mix again. 4. Allow mixture to simmer uncovered for at least two hours, stirring occasionally. 5. Serve over hot noodles. A few weeks ago, The Husband said he wanted nachos. He went out to the store and bought all the stuff he needed for them and decided to make them at home. They were delicious and have now become one of our favorite foods to make when people come over. Everyone has really liked them and the great thing is you can add any ingredients you'd like. We make them SUPER cheesy... like SUPER DOOPER cheesy. We use a foil lined, large pizza pan which helps with clean up and makes enough that you can feed an army. For our March Madness party last week, there were six of us here and we still had leftovers. 1. Pre-heat oven to 325 degrees. Cook ground turkey in a skillet until cooked through. Drain and set aside. Line a large pizza pan with aluminum foil. 2. Put some chips on the pan and spread them out. Put some of the ground turkey, olives, green onions, and shredded cheese on top. Repeat until all ingredients have been used up. 3. Put nachos into the oven and cook for 10-15 minutes. 4. Remove from oven and allow a few minutes to cool. Top with sour cream and guacamole.